​ Seven years ago, Gregory Contreras was a senior at John Marshall High School, waiting to hear from dozens of colleges to which he had applied. Now, he is set to graduate from the University of Southern California with a Master of Arts degree in economics. Looking back on his journey, Gregory attributes his success to a combination of both personal qualities and lessons he has learned along the way. He has always tried to give himself options; he is resilient; and he has discovered the power of setting goals and asking for help. In 2012, Gregory was initially set to attend San Diego State, which offered an undergraduate major in television, radio and film. He had already submitted a deposit when he received an intriguing offer from Syracuse University in upstate New York. He could attend with a solid financial aid package if he was willing to delay his start until the following spring. It was a difficult decision. “I asked myself: Which choice would I regret?” he recalls. He figured he had lived his entire life in California, so he wouldn’t regret not attending San Diego State. Syracuse, on the other hand, presented an opportunity that he would always wonder about if he didn’t take. His thinking was influenced by a trip to Boston in pursuit of a scholarship to another eastern college. He didn’t get the award, but the trip whetted his appetite for adventure. He traveled there with Susan Philips, CollegePath LA’s executive director. When he received the Syracuse offer, he consulted Susan. “You need to go,” she told him. Gregory started to visualize himself at Syracuse. He knew it was really cold there. He would experience snow. He felt lucky and excited by the prospect of living in a new place. He viewed the delayed start as a plus. He would work and save money over the summer and fall to supplement his finances. CollegePath LA bought him a winter coat! At Syracuse, Gregory enrolled as a psychology major in the college of arts and sciences. His goal was to transfer into the university’s prestigious communications school that offers majors in television, radio and film. “That was a big thing in my head,” he says. He buckled down and worked hard. “I was very strategic in choosing classes.” He needed to achieve a strong GPA to give himself the best shot of admission. In the spring of 2014 he successfully transferred into the S.I. Newhouse School of Public Communications. He started learning about careers in the field, and the difficulties of breaking into radio, movies or television. It was daunting. He enjoyed writing, and thought about becoming a screenwriter, but he also wanted a regular job that would provide a good living. “I wanted to have options,” he says. He started exploring courses in other areas that interested him. He was attracted to economics. It required analytical thinking about how the world works. Screenwriting started to feel more like a hobby than a career after college, he says. At the end of his junior year, he started thinking about graduate school in economics. He contacted Susan Philips for advice. She lit a match under him. “I needed to kick into another gear,” he says. He needed to take the Graduate Record Examination (GRE). He needed letters of recommendation. He had been slacking off and needed to ramp up the studying to achieve top grades his senior year. He bought a GRE practice book and started studying. On weekends he set an alarm to get up by 6 am to take a practice test. This routine simulated the real exam situation. He corrected each test and studied the questions he got wrong. Over four or five weeks he saw his results steadily improve. He knew he had to achieve a certain score to be a competitive applicant to graduate programs. Gregory is shy, and asking for recommendations wasn’t easy for him. But with Susan’s encouragement, he contacted a professor he respected whose course he had taken the previous semester. “He was so much more helpful than I expected. He was really interested,” Gregory says. Not only did the professor write a recommendation, he became Gregory’s mentor and guide. “He gave me confidence to apply to USC,” Gregory says. “I didn’t think I would get in.” The professor helped Gregory narrow his list to six programs, including two PhD programs. When the acceptances arrived, Gregory decided to attend USC, even though it was more expensive than other options and would mean adding to his debt load. He graduated from Syracuse in December 2016 with a double major in Economics and Television, Radio & Film. During most of his academic career, Gregory has juggled classes and jobs to make ends meet. During his first year of graduate school he worked full-time as an assistant manager at Walgreens. In this role, he was in charge of employee scheduling, including his own. He lived with his mother and older brother in the San Fernando Valley, worked in Echo Park, and attended classes at USC. “School got harder,” he says. He wanted to focus on his classes, so he stopped working his second year at USC. After the first or second semester, he had realized that he didn’t want to spend another six years pursuing a PhD, so he will graduate this spring with a Master’s degree. "I want to be out in the working world. I like having money in my pocket,” he says. Soon, Gregory will be facing his next hurdle: Finding a job. He’s mulling his options in consulting, finance and banking. He is attending discussions with real world professionals brought in by USC faculty to talk to students about what they do. Gregory is confident that the skills he has learned in his college journey, thinking ahead, networking and setting goals, will help him forge a satisfying career. ​​ On the afternoon of Saturday, June 2, 2018, three veteran rock musicians performed a special concert to benefit CollegePath LA. Two of the rockers are teachers at John Marshall High School and a third taught there for many years. Marshall teachers? Rock musicians? Who knew? The Hickmen band, anchored by Marshall teachers Mike Finn and Mike Jones, performed for about 90 minutes, followed by songwriter/performer Jack Fris, a former Marshall teacher. About 150 students, teachers, alumni and friends filled the Bootleg Theater, a converted warehouse in downtown Los Angeles. The Hickmen regaled attendees with thumping renditions of “Costco Socks” and “San Bernardino County Blues” among other thought-provoking songs. From the stage, Mike Finn praised CollegePath LA’s work at Marshall, and invited executive director Susan Philips to say a few words about the community group, a nonprofit organization that helps high school students explore careers and apply to college. 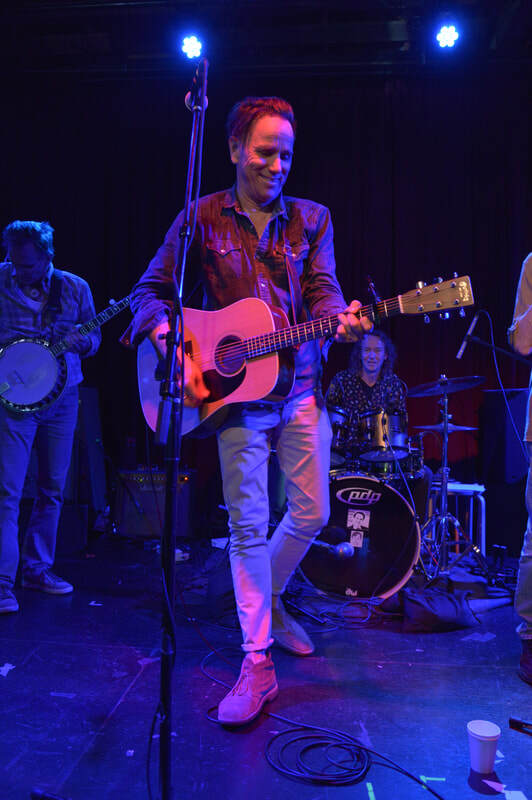 The band also showcased its members’ instrumental virtuosity with riffs performed on the banjo, accordion and keyboard, as well as drums, acoustic and electronic guitars. The two-hour gig concluded with a riveting harmonica solo performed by Jack Fris. In a nod to his former students in the audience, Fris said he was gratified to see so many there who are now “all grown up.” The shout-out drew a loud, enthusiastic response. The benefit raised about $1200 for CollegePath LA, and will be used to hire buses to take students to visit colleges in the Southern California area. ​ Cassandra Colon, a student at John Marshall High School, was named a Warren Christopher Scholar, an honor that comes with a $20,000 award. 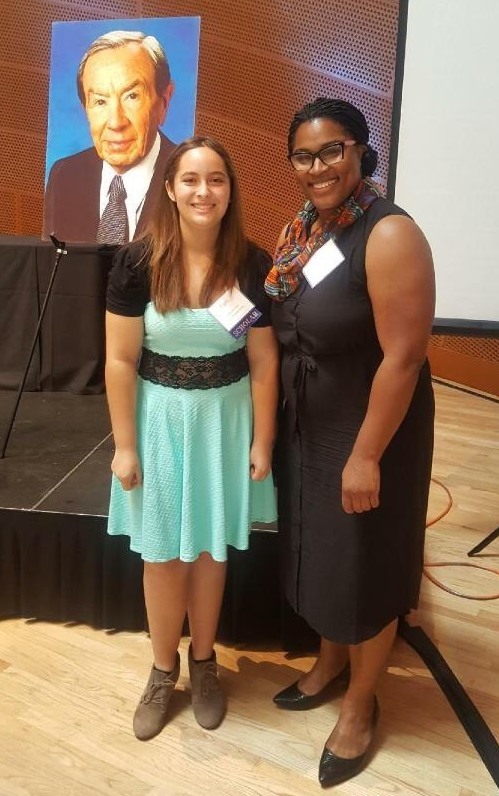 The scholarship, given each year to between 10 and 15 sophomores in the Los Angeles Unified School District, includes personal mentoring, internships and career advice. ​ The Warren Christopher Scholarship Fund was established in 1992 with a gift by O’Melveny & Myers LLP to honor Warren Christopher, the law firm’s former chairman and senior partner, when he was appointed U.S. Secretary of State. He passed away in 2011 at age 85. A special shoutout to five CollegePath LA committee members who are set to graduate from John Marshall High School on June 9, 2017. The committee, which meets weekly on campus, plays a vital role in supporting our program. Student participants help plan, promote and staff events, including workshops to write college essays, complete financial aid forms and explore professional careers. Following graduation, the students join CollegePath LA’s alumni group and return to Marshall periodically to tell students about their college experiences. CollegePathLA organized the committee in 2011 to create student leadership opportunities and to strengthen connections with the volunteer community. Here are some committee members’ thoughts about their CollegePathLA experience. “Being a part of CollegePath LA, I learned that in my community there's always going to be someone who is willing to help, and that helping other people is an important part of being in a community. ​ Susan Philips, director and co-founder of CollegePath LA, is being honored for her contributions in developing college and career access programs at two Los Angeles high schools. The award will be made on Sunday, November 13, at the 21st annual L.A.C.E.R. Afterschool Program fundraiser brunch. Susan will receive the Sharon Stricker Achievement Award for her efforts at Hollywood High School and Fairfax High School. L.A.C.E.R. (short for Literacy, Arts, Culture, Education & Recreation) was founded in 1995 to provide underserved students at Los Angeles middle and high schools with free arts, athletics and academic activities after school. Sharon Stricker, L.A.C.E.R. co-founder and former executive director, will present the award. Offering students help with college and career exploration has long been a dream of Sharon’s. Susan will be the first recipient of the award. The fundraiser brunch will be held on Sunday, November 13 at 11 a.m. at the Avalon Hollywood, 1735 Vine Street, Hollywood. Click here for more information, to register for the event, or to make a donation. ​ Over the summer I was a paid instructor at iD Tech camp, which introduces kids to robotics, film, programming and game design, among other technologies. I worked at both UCLA and Caltech, alternating between the two campuses. The students, ranging in age from eight to 17, had signed up for weeklong sessions. I have a lot of experience with technology and consider myself a fairly big geek. As a result of this knowledge, I was asked to teach a different course almost every week. I heard about the job at the University of California, Santa Barbara, where I’m a senior this year, majoring in computer science. I completed an online application (https://www.idtech.com/jobs) and was selected for a telephone interview. One of the questions was, “What would you nickname yourself?” I replied, “Binary,” which became my name at camp. Having the opportunity to pass my knowledge on to a younger generation was one of the most rewarding experiences of my life. I will always remember the smiles on those kids’ faces. The iD Tech staff was extremely supportive and spread nothing but positive vibes. Among the programming languages I taught were C++, Java and Objective C. I also taught game design and development software, including Unity, Unreal Engine 4 and Shootmania. Teaching so many different subjects was a great experience, but very challenging. I had to prepare a completely new lesson plan every week. We usually spent the first half of the week learning new concepts and getting accustomed to the software. The remaining half I helped students brainstorm ideas for their own personal projects. Kids love being creative. From there on out I would guide them as they completed their projects. On Fridays, the last day of each session, we had a big family showcase. Family and friends would come check out all the awesome knowledge the students learned and applied to their own creations. The level of excitement was always high and it is an experience I won’t ever forget. My experience working this summer at Harvard Medical School and Boston Children’s Hospital was the most academically challenging experience of my life. It felt like I was in another world...and I loved it! I met so many wonderful, intelligent people full of dedication. My mentor was Dr. Maria Lehtinen, whose lab is part of the Department of Pathology at Boston Children's Hospital. Her neuroscience research focuses on the mechanisms that regulate brain development and neural stem cell specification. The lab is affiliated with Harvard Medical School and shares instruments with another HMS lab. It was inspiring to work with Dr. Lehtinen, a woman scientist who has overcome personal hardships of her own. She pushed me to master concepts/techniques at a pace I would never have thought myself capable. I studied circadian gene expression in the choroid plexus of the mammalian embryonic brain using a mouse model. I learned to handle mice and dissect their brains. At the end of my research and cramming study sessions with other HMS students, I marveled to myself: "Hey, you got this!" Near the end, I was engaging actively in discussions and contributing ideas. I presented my research at the National Institutes of Health in Bethesda, Maryland and was invited to visit inside the White House in Washington D.C.
My mentor was impressed with my work and invited me to return. So next summer I will be working at Harvard again! I learned about this summer opportunity, called STEP-UP, through the coordinator of the Latino and African American Internship Program at Children's Hospital Los Angeles. Both LA-HIP and STEP-UP are for high school students. STEP-UP accepts undergraduate students as well. The application consists of a personal statement, a few short essay questions, transcripts, and two letters of recommendation (for college students one has to come from a professor). STEP-UP provides a $4,500 stipend for the summer. The program paid for all of my travel expenses from LA to Boston and then to Maryland/Washington D.C and back home. In Boston I rented a room in an apartment with two other Harvard medical students that I found on Facebook (there is a page where people post rentals and summer sublets). I used my stipend to cover my rent expense. Boston is a beautiful city! I also visited New York, New Hampshire, Rhode Island, Cape Cod and Nantucket Island. Now, I really wish I had applied to colleges in the East Coast. I wouldn't mind living in the East for graduate school...who knows! In 2010, Jorge Rodriguez was an ambitious high school senior navigating his way through the daunting gauntlet of the college application process. 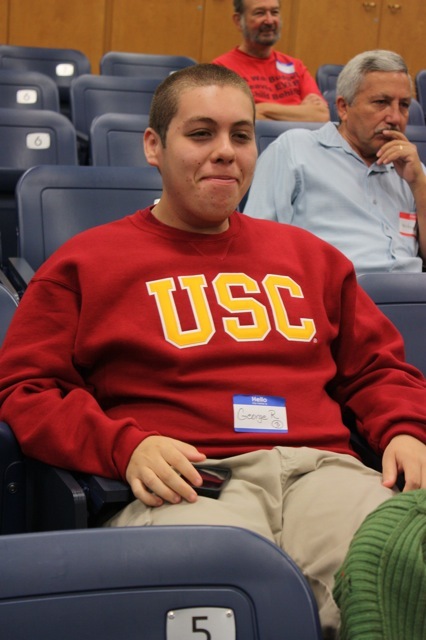 A teacher put him in touch with Susan Phillips and Lori Zimmerman, who helped him finalize his essays, whittle down his choices and successfully gain admittance to USC. He joined a small focus group of students that met at Susan’s house with a clear goal of intervening early in the college application process. “We didn’t want to wait until panic set in,” he says. Together, the group designed a pilot program and curriculum. It came up with a name: CollegePath LA was born. While he was a student at USC, Jorge served as a coach for several Marshall High School students and helped CollegePath LA expand its mission to reach a broader student population. After graduating from USC in 2014, Rodriguez accepted a position as a science teacher at Jordan High School. It’s a challenge that Rodriguez has met with the determined resilience that he brought to CollegePath LA in its infant stages. “I’ve been able to get them to care, to reverse expectations,” Rodriguez reflects. “I think CollegePath is a key factor. I’ve met so many people with different perspectives. Rodriguez continues to work with CollegePath LA, now as a mentor rather than a student. He tutors Marshall kids in chemistry, while teaching a full load. He pairs them with CollegePath LA coaches. He attends alumni meetings. “What I love most about [CollegePath LA] is that the relationships don’t end on graduation day. It’s for life,” he says.